It is not enough to merely weigh enough to make the minimum weight, or just barely slip in under the maximum weight when showing pigs. The pig must look its absolute best when it takes its first step into the show ring. Anything less is unacceptable. So, how do we accomplish this task? The best method to arrive at the weight you desire for your pig and have it looking its best is to think about this when you purchase your pig. Beginning to think about this with 10 days or less until show time is poor planning, and a design for failure. 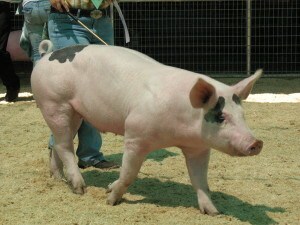 Progressive judges are selecting modern showpigs that are fresh, full, youthful, muscular, and are shown at about 6 months of age. So, the best way to limit the aggravation and mental anguish of holding a pig for extended periods of time is to purchase appropriately aged pigs. Pay attention to the date of birth, and use the days until weigh in at your show to calculate the age the pig will be at that time. If you find a really good pig that will be 7 months old at weigh in, select another that will be the right age. Hand feeding your pigs will result in most control over weight gain. You determine how much feed the pig will receive each day, and you have control over the ultimate weight of the pig. Allow your pig to grow fairly normally until at least 150 lbs. It is important to feed the correct amount of feed daily. Under feeding the pig will result in poor growth performance and underweight pigs with inferior muscling and body condition. By feeding the correct amounts per day you will ensure your pig will have the proper nutrition to adequately express its genetic roadmap. If nutrition is limited early on before the pig reaches about 150 lbs, the pig will not have the opportunity to reach is genetic potential for muscle and frame size. In addition, the pig might well be permanently programmed for a negative outcome. Since the pig needs more muscle shape, Paylean® will be fed for the final 14 – 21 days. Paylean® will greatly increase growth rate. So, the pig will need to grow a little slower prior to being fed Paylean to manage weight. The pig also needs help with rib shape. High Octane® Depth Charge® will help greatly with adding gut fill and rib shape. The pig will also need to be fed an energy supplement to increase body condition or cover. The basic principle behind slowing growth and keeping the pig fresh, muscular and youthful appearing is to meet its daily nutrient requirements in as small a daily feeding rate as possible. In that way the pig remains looking great, but cannot grow fast because of the small daily meals. To accomplish this, use the supplements above to concentrate essential amino acids, energy, minerals and vitamins. Another very important point to remember is the pig will lose some weight during the transportation to the show. At any one time during the feeding period, a pig will have somewhere between 6 and 8 lbs of feed in its digestive tract. When the pig is transported to show, it empties the contents of the digestive tract along with losing some water weight in the form of urination. Conservatively, the average pig will lose 5 lbs during transportation. Add this weight on the weight the pig can gain before going “overweight”. The pig weighs 240 lbs currently, the maximum weight limit is 280 lbs, and it will lose 5 lbs on the trip to the show for a total amount it can gain in the next 45 of 45 lbs (280 – 240 + 5). If the pig did not need to improve in cover, Champion Drive™ could be fed at 1 lbs per day and the Power Fuel®could be omitted at this point. However, Paylean® does two other things well in addition to improving weight gain. Paylean® also decreases the amount of body fat (if sufficient energy is not fed each day), and it also drastically increases muscle. So in order to produce a pig with “soft” muscle on show day, we will need to improve the body fat (cover) of the pig prior to feeding Paylean®. That is why the Power Fuel® has been placed in the diet above. Champion Drive™ will also do a very nice job at improving the shape and volume of the pig’s top. It is a very useful tool in creating the “show” look you want. Depth Charge® is a pelleted product that expands in the pig’s digestive tract creating fill, and helping with rib shape. Depth Charge® is very palatable and usually there is no need to wet the product prior to feeding. It is also important to note that when hand or limit feeding the pig needs to receive two equally sized meals about 12 hours apart each day. So, divide the above in two equal feedings morning and evening. In addition, never limit water intake. The pig should gain an average of about 0.7 lbs per day on the above diet. Remember that pigs are different and respond to nutrition, especially small daily portions differently. One pig might gain 0.5 lbs per day on the above diet, while another may well gain 0.8 lbs per day. So weigh the pigs frequently when limiting weight gain. Weighing every day is not too often. If you find the pig is gaining slower or faster than you desire adjust the feed, either an increase to improve growth rate, or decrease to slow growth rate. At the end of the initial 21 days, the pig should have gained about 15 lbs. That will put the pig at 255 lbs with 24 days until weigh in. Remember that the pig will be fed Paylean® the final 14 days, so for the next 10 days we will need to 1) continue to limit growth, 2) increase body condition, and 3 keep the pig looking great. The pig should again gain 0.70 lbs per day. However during the period the pig should be increasing body condition (cover) at a faster rate. At the end of the 10 days the pigs should have gained 7.0 lbs and should now weigh 262 lbs. There is now 14 days left until weigh in, and the pig can gain 23 lbs, for an average daily gain of about 1.64 lbs per day. If you find that the pig is gaining less than the 1.64 lbs per day, you can increase the Powerfill™ to 2 lbs per day. At the end of this 14 day period the pig should be muscular, fresh, youthful, and full. Remember that the goal is to not only get the pig where you want it to weigh, but have it looking its absolute best on show day. Exercise is a vital component to a great feeding program. It is especially important when managing weight gain. A daily routine of walking and practicing showing is important to the success of your showpig project. High Octane Heavy Weight™ is a new high fat (70%), water miscible product that helps increase daily feed intake, fat cover, and growth rate. It is very useful in scenarios where limiting growth and keep the looking great is a must. Feed at the rate of 2 to 4 oz per day to help encourage more feed intake, and 4 to 16 oz per day to improve fat cover and growth rate. Do not be afraid to ask for help. There are experienced feeders that can be a wealth of experience for you. This entry was posted on Saturday, September 22nd, 2018 at 10:59 am	and is filed under News & Updates. You can follow any responses to this entry through the RSS 2.0 feed. Both comments and pings are currently closed.